Happy Hump Day! Halfway through the week, and can you believe we’re nearing the end of the year? I can’t fathom it!! We’re big fans of graphic tees over here. However, the thing with graphic tees is they can sometimes be a bit, well, cheesy. But there are so many out there that aren’t cheesy at all. 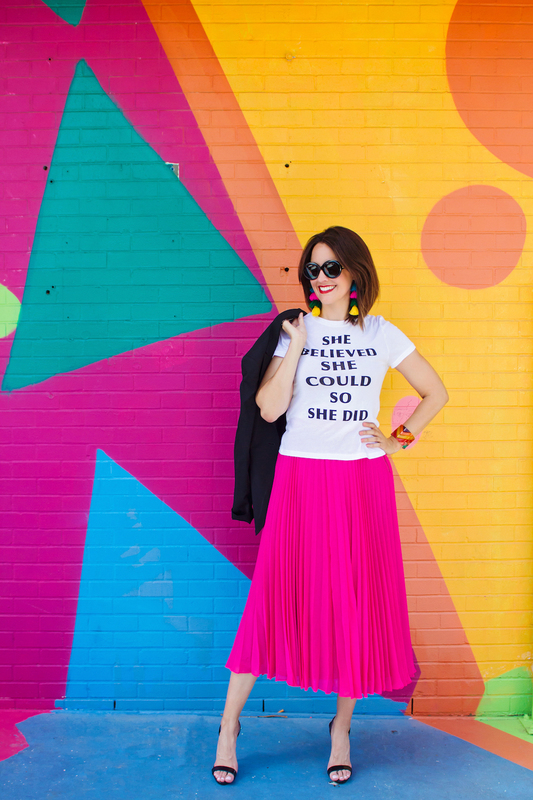 In fact, they are seriously cool, stylish, and even inspirational! And today’s look is featuring a current favorite of ours. 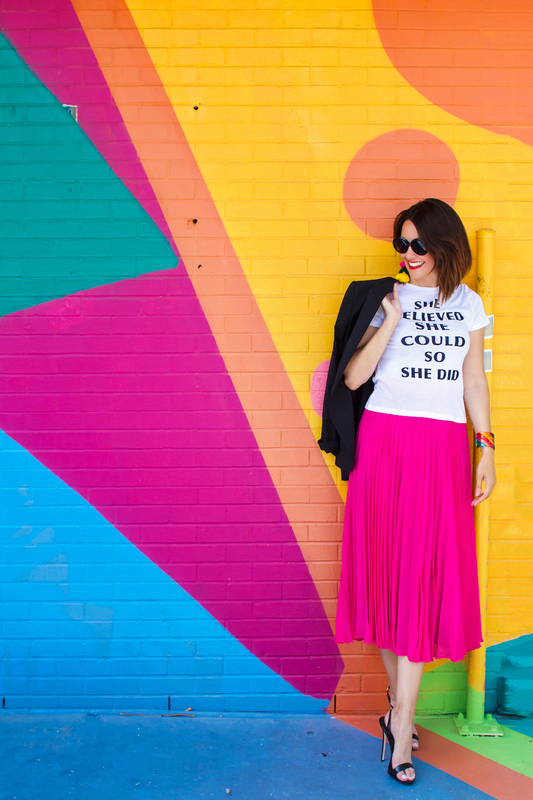 Alice + Olivia is currently stocking some amazing graphic tees. They feature quotes, which you know how much we love. And with them coming in black and white, they truly go with so much, and you can actually dress them up or down. Below are some of our favorites from Alice + Olivia that you can shop right now. 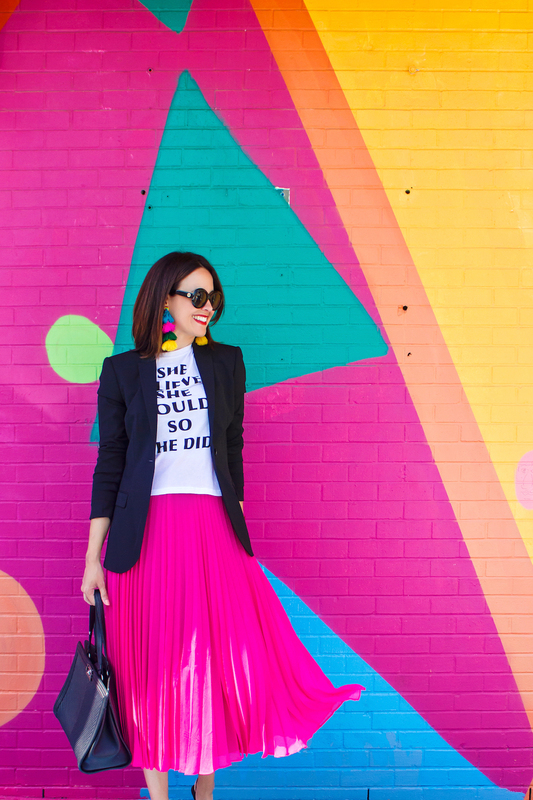 Juxtaposition is one of our favorite fashion secrets! What is juxtaposition? By definition, it’s the pairing of two things with seemingly contrasting effects. It creates a really visually interesting look! 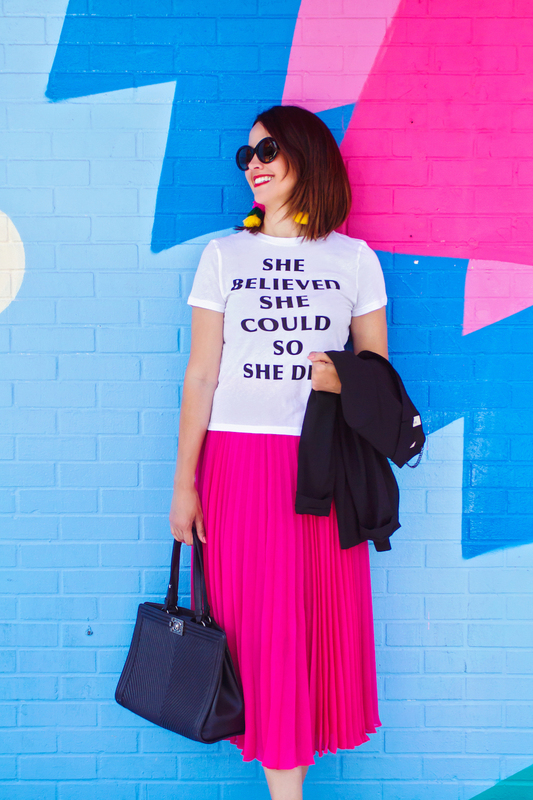 Don’t you love how Carrie styled this look? 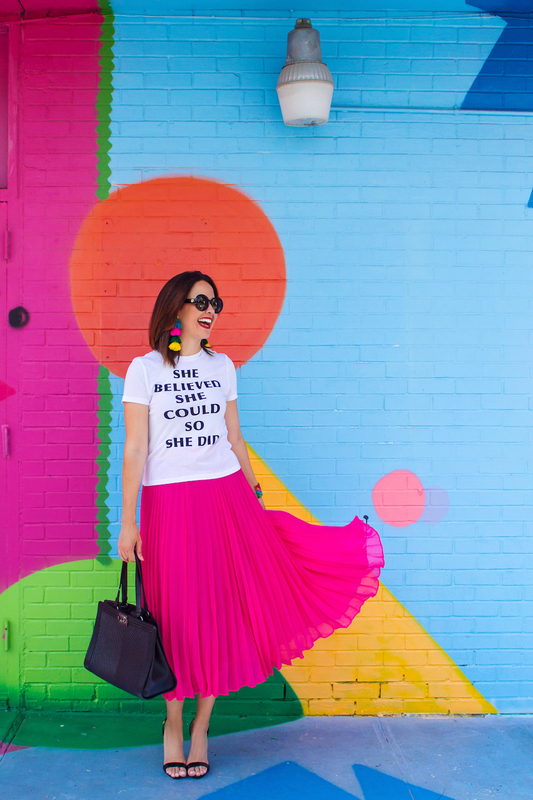 How fun is the bright pink pleated skirt (which you’ve seen here) with the tee? 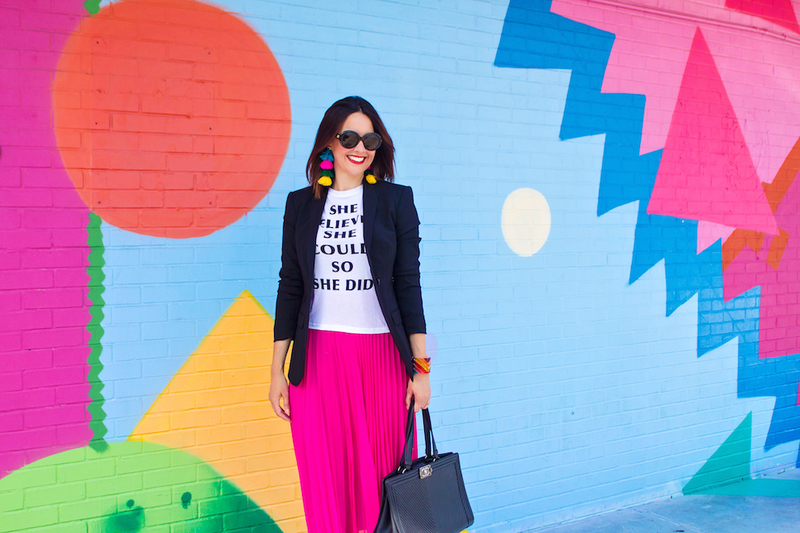 And the colorful earrings add such a fun touch. As well, you can see how she added a classic black blazer in some shots which makes it slightly more sophisticated and work appropriate (depending on where you work). LOVE this look! 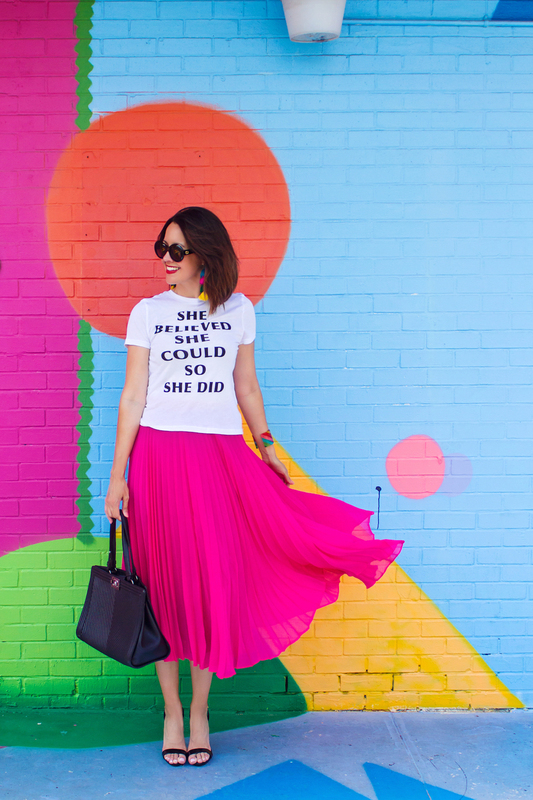 And I’m dying over how gorgeous that pink skirt is! Thanks so very much, Holly!